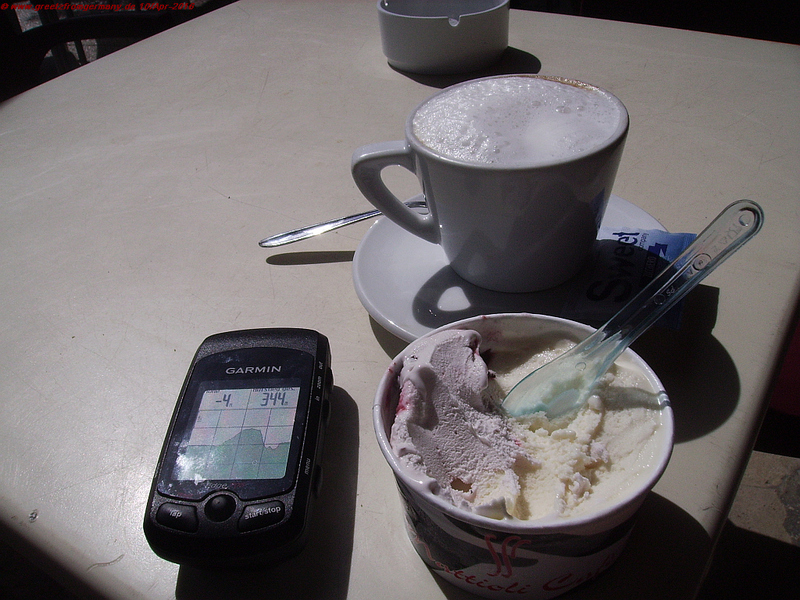 During the obligatory ice-cream stop the author makes when riding one of her favorite brief 2.5-hr spins in the Taunus area, she had a chance to compare that ice-cream to the famous sweets (which are very often not that sweet, fortunately) of Sicily. Of course, Sicily is known very well for the gelato they make there, especially in the Palermo area. It is soft and rich and full of the flavors of the citrus fruit they harvest there: mandarine oranges, oranges and lemons, primarily. Thanks to Sicily’s time of Arabic ruling, a boost in culture, science and … culinary arts made it to the island between the 9th and the 11th century. They brought the technology of efficient irrigation systems which made it possible to increase agricultural production. Add „the art of Arabic frozen sweets manufacture“ to „having more fruit and almonds by better and wider-spread irrigation“ and you know that we have to thank the Arabs for Sicily’s mastry of ice-cream making. 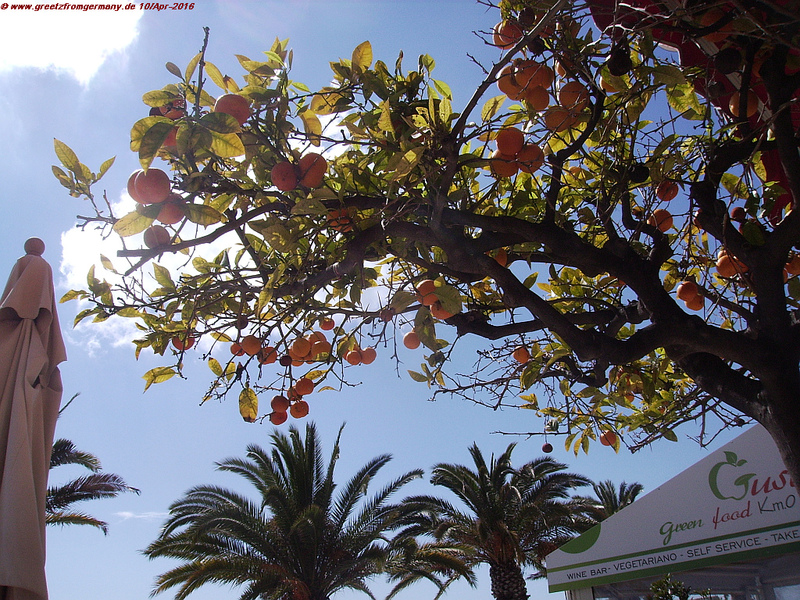 Enjoying a mandarine orange ice-cream under a mandarine orange tree, in the warm Spring sun, intensifies the flavor of the dolce, it seems. 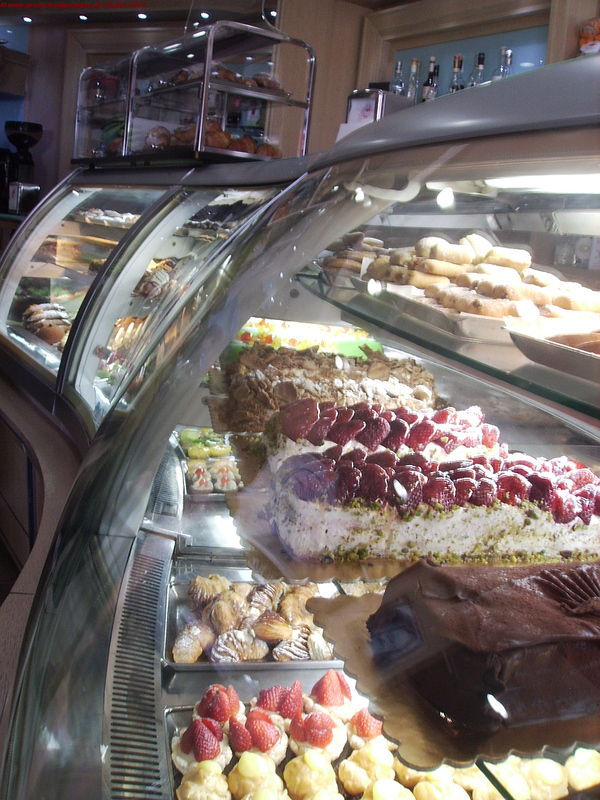 But a true Sicilian goes by the local saying of “never without dolci”, i.e. they never go on even very short trips without any kind of sweet. And since ice-cream is a little difficult to carry in your pocket or boiling-of-summer-heat car, they have invented a confusingly broad range of cookies, candy or the like they can carry to fulfil the sayings request. And those who have tasted the dolci of Sicily understand perfectly well why that this is a very wise saying one should really adhere to – because it is simple bliss. 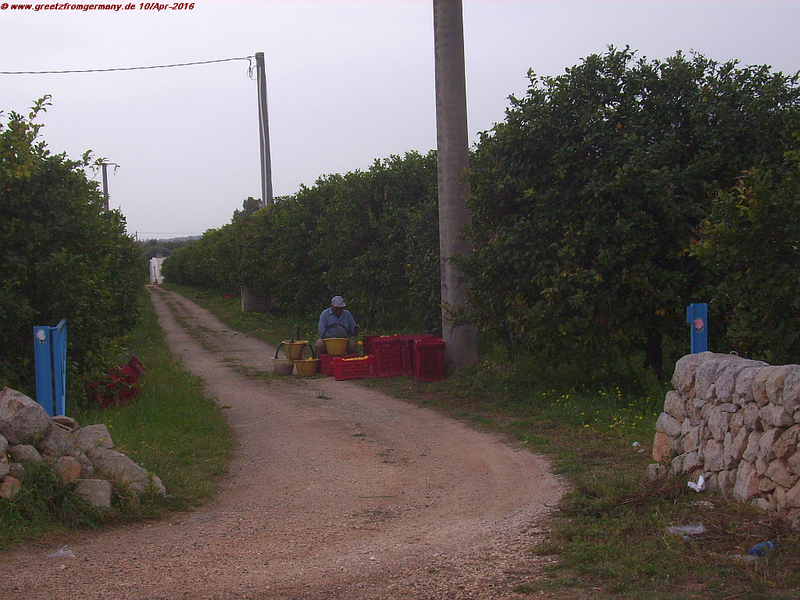 Sicily is so rich in oranges that only the best – hand-picked by very scrutinizing seasoned folks – are making it from the plantation. Besides the traditional gelato which is basically like our ice-cream (only better, richer in taste, without any sort of artificial flavoring), they are famous for what they call “granita”. Granita is something in between a drink and a refreshing sweet dish, related to sorbets, if you like, and made of water, sugar and fruit juice, again often from lemons or oranges, but also sometimes from so-called almond milk or coffee … very yummy! 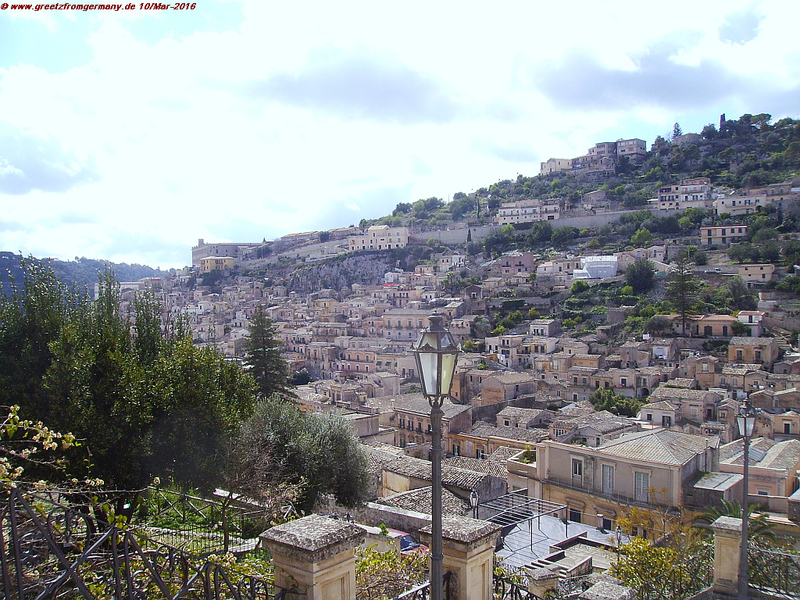 Modica, conquered by the Arabs in 845, was completely destroyed by the big earthquake of 1693 which took the lives of 60,000 Sicilians. The rebuilt city has stunning Baroque architecture and belongs today to the UNESCO World Heritage. But there is more sweet stuff to discover. Don’t expect anything to taste like what you expect it to taste like by its looks and/or by its name. Think “chocolate” as a German or Swiss – and be surprised what you get when you buy chocolate in the Southern Sicilian town of Modica. Because they make their very special and own bar of black and call it “chocolate”, but it is rather crystalline and best enjoyed and appreciated by letting it melt in your mouth, without chewing. Because in Modica, the cocoa beans are warmed up to only about 40°C and then ground to little smithereens that are mixed and blended with sugar granules. That makes for a completely different texture – and a very pleasant and joyful taste bud experience. If a few locally famous flavors are added – from the grapes they use for the famous red wine “Nero d’Avola”, from wild fennel or from the sweet Sicilian desert wine called Marsala – you have as extraordinary as local a specialty as you can wish for. 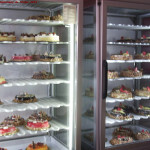 A typical small village bakery display of assorted cakes and sweets. But if you would rather like to go simply with rich and sweet and keeping the promise made to the eye when reaching your foreign tongue, go for one of the fancy cakes. Rarely has this English word of a cake being fance been as fitting as for the cakes and tortes you find in Sicily. Great report on the dolci of Sicily! I would really like to try the chocolate of Modica. Granita I like too (best on the spiaggia), and Orzata (the almond milk). I’m a fan of Marsala as well. Inspired by your report, this evening I even went and cooked chicken fillets in a Marsala sauce. So I had a wonderful notte siziliana with Marsala! Happy you enjoyed the post, John – actually even twice, in a way: I bet the chicken in Marsala was quite a treat!